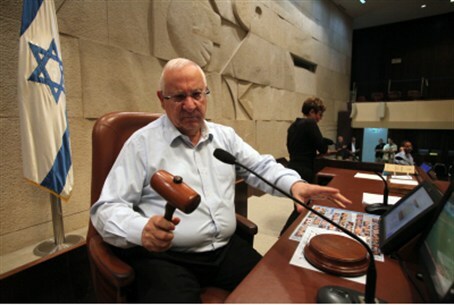 Knesset speaker Reuven Rivlin on Thursday called for lawmakers to moderate their language and avoid incitement when dealing with emotionally charged issues of public policy. "There is no doubt that Israel faces a serious problem regarding illegal aliens and asylum seekers, and the government must find a solution and act," Rivlin said. "Our duty to society is to protect our national interests, but difficult and emotional social issues must still be approached with Jewish values, which also seeks to protect and help the helpless," Rivlin said. Rivlin also sharply criticized violence that occurred after a rally of more than 1,000 calling for immigration enforcement in south Tel Aviv on Wednesday evening. The people "may demonstrate and protest and demand the government formulate a solution, but there should be no incitement – and it is forbidden to use the same tactics anti-Semites used against us [in the Exile]." "We suffered greatly from incitement and harassment," Rivlin said. "We must be committed to sensitivity and finding just solutions. The main problem is not the infiltrators and refugees, but the lack of a clear policy from the government of Israel." He then presented Likud MK Miri Regev as a positive example of good leadership in her approach to Israel's illegal immigration problem. "I compliment my friend Miri Regev who has been vigorous and active in her efforts to demand from the government clear policies and workable solutions to the problematic reality of illegal aliens in Israel," Rivlin said. "The anger of residents and business owners in south Tel Aviv is completely understandable," he added. "But when an angry mob takes to the streets it is too much!" "Leaders must guard their words, restrain their anger, and find solutions rather than inflame passions," he said. While Rivlin did not single anyone out by name, he appeared to be referring to Likud’s firebrand MK Danny Danon. Danon – who chairs the Knesset committee tasked with preventing illegal immigration to Israel – declared at Wednesday's rally, "The state of Israel is at war with an enemy state that has formed within Israel and has its capital in southern Tel Aviv!" However, Danon was joined by fellow Likud lawmakers Miri Regev and Yariv Levin, and Michael Ben Ari of the National Union party. However, witnesses say vast majority of those who attended the rally both arrived and departed peacefully.